Warning! Warning! The following information may be considered "hippie dippie." Don't say I didn't warn you! But, seriously, you should be used to this from me by now. If you are a follower of my blog, you will know that I had surgery this past June. Without getting in to too much detail, it went very well. It was a major surgery, and at first I did very well with it. Unfortunately, the drastic change in my body over the past several months has caused my health to go into a tailspin. I am currently unable to work, walk with out a cane/wheelchair, and some days laying in bed is the best I can do. So if you will bare with me, I am just now feeling less brain fog and am able to focus enough and feel strong enough to type. I am feeling so called to continue with my writing and making that a priority, so my hope is that I can do some posts for you, even if they aren't as full of photos, or DIY projects. My goal is to try to share with you as often as possible, even if it is something as simple as a thought, or a goal, or just some of my favorite things. I'm also hoping to get the husband to participate in writing some posts very soon, as well, because he is usually involved in pretty much everything that I share with you here in these posts from our cottage. I just know you would love to hear from him and his perspective! And he's the most entertaining person I've ever met in a way that is unlike anyone I've ever met. I have to share the wealth! So back to the message at hand... Today I want to share a technique that I have started using to help me to feel better. I'm sure a lot of you have heard about using visualizations to help with pain, or to treat cancer. The most famous one that comes to mind was the little boy with a baseball sized brain tumor that would picture his cancer as "Planet Meatball" and he was Luke Skywalker and would attack it every night with his lasers and bombs. One night he went in to attack it, and it was gone and told his parents he was cured. They hesitantly took him for X-Rays, only to discover it was completely gone. I've always liked this idea. I know that our body's are perfectly capable of healing themselves. That's not to say that doctors, and medicine is not necessary, by any means. Is our body not using the medications to "heal itself?" And in the same breath, can our thoughts make an illness worse? How many times have you heard the phrases, "I can't stomach the thought," or "I can't digest this idea." Where do you think these sayings came from? My belief is that like attracts like. Everything is made of energy, as we know, and that includes thoughts. If our thoughts are made of energy, and we are focusing on a particular thought, what keeps that from attracting to things "like" it? Nothing. This seems pretty cut and dry in theory, but in reality, its pretty tricky! As humans, there are so many factors that play into this. No one would intentionally think them self into a sickness. I know I didn't walk around all day thinking, "I have cancer, I am sick, blah, blah, blah." But I will tell you, I didn't walk around thinking "I am healthy," either. That's just part of that being a human being, again, and we all take everyday things for granted. With all of this time I've had recently laying, and thinking, I've decided, I'm not able to do much, so I might as well try and fix myself!! It seems that this should've been something I started back when I first started feeling bad. Our normal reaction is to go to the doctor, and have them tell you what's wrong and fix you. It's a quicker fix than trying it yourself. I've been to so many doctors in my life, and more often than not, I've had to doctor myself, or figure out what is wrong on my own. Its no surprise, because who knows our body better than ourselves? Some were great, thank goodness, and they helped me with significant issues that I could not have taken care of on my own and were very dire situations. 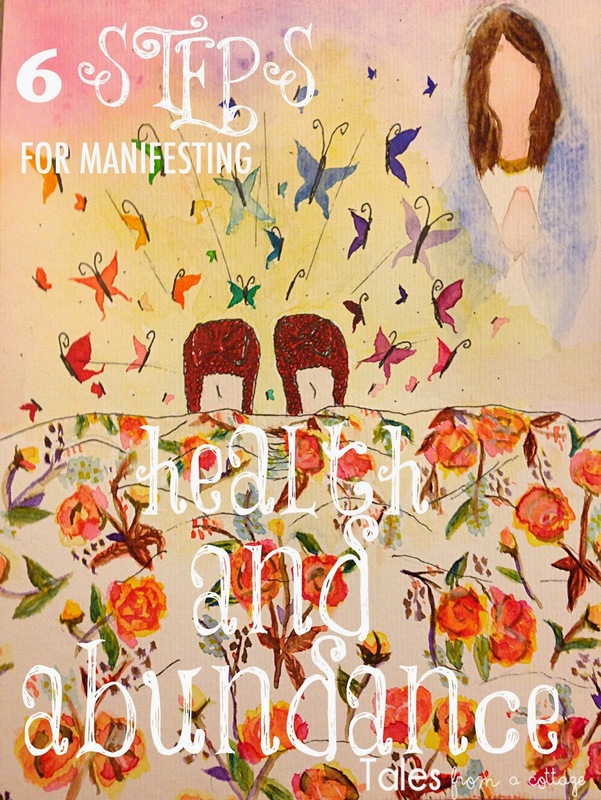 Manifesting good health, or anything else, takes time. It happens in its own time frame. The time frame is something we don't have control over. 1. Feel as if you already have what you are trying to manifest. It is extremely important that when playing through your visualization in your mind, that as you imagine yourself in the scenario, you feel in your heart, body, and mind as if you already have or feel what you want. I liken this to a dream. When you are asleep and dreaming, its common to have physical responses to a dream, like crying or laughing, kicking (sorry, Jared, you deal with this one from me a lot), or waking up out of breath or tired. That's because you are feeling and BELIEVING that what is happening in your dream is real. If you can make your self feel your visualization that physically, there is no stopping that dream from becoming a reality. 2. Focus only on what you DO want, not on what you DON'T want. I heard this tip a long time ago from the movie The Secret. (You can find the movie, which I LOVE here, or the book here.) I used this idea for my wedding day. It was a wonderful backyard wedding outside at my grandparents house. Every time I pictured our wedding day, I would imagine bright blue skies, and a warm 78-82 degree weather. I refused to think, "I hope it doesn't rain." Of course we came up with a backup plan, but I did not focus on that. The universe interprets your thought, not whether you do or don't want it. So if the subject of your thought is rain. You're gonna get rain whether or not you want it. Our wedding day had the best weather you could ever imagine. 3. Have the heart of a child. I believe this is what makes the biggest impact. I believe our natural state is just love. If you spend time with any newborn baby, you can see that that's all they know. They have yet to be told they aren't good enough, or that the color of skin makes you different, or that fairy tales aren't real, or that something doesn't exist. If you tell a young child something is true, they will believe it. As we get older, we have experiences through life that pull us farther and farther away from that natural state of just love, even unintentionally. Children are able to see ancestors that have passed and angels because of this. My mom said my sister and I were always looking and laughing at things that weren't there as babies. You may want to start paying more attention to your kids' imaginary friends now! Try thinking back to memories from something fun or magical that happened to you as a child. Those memories will instantly take you back to the mindset that you had as a child. One memory I use is a tradition that I still do to this day. As a very little girl, I would always wave good bye to my grandma and grandpa until I couldn't see them anymore out the car window. I have always done this, and still do when I leave my grandpa's house. Waving goodbye and smiling and thinking of how much I love them takes me instantly to that natural state of love. I'll come back to this in a bit. 4. Try "attacking" with love instead. Love has a much higher frequency than fighting or attacking. For some, attacking a problem works best because they can relate to it better. There have been several studies done that have cancer patients using visualization methods. One group attacked it, like in Planet Meatball above. The other group sent the cancer away with love. The love groups had significantly higher success rates than the fighter groups. I'm like Michael Jackson, "I'm a lover not a fighter", so this struck a chord with me. Dr. Wayne Dyer's daughter used this technique as a 7 year old girl to completely rid herself of warts on her face that were getting ready to cover her eyes. You can hear her story in this wonderful video of his tour to the sights of visitations from the Blessed Mother here. Its amazingly inspirational and uplifting. You're thinking, "What in the hell is she talking about?" If you visualize and feel as if you already have what you want at night right before and until you fall asleep, your brain is gonna marinade in all those super good thought juices. If you think about your fears before you fall asleep, your 8 hours are gonna be full of fear and nastiness, and that will only set you back. Happy thoughts at bedtime, people. If you find your mind straying, acknowledge it and then get back on track. Its like a prayer that will continue all night long. 6. Don't beat yourself up, for goodness sakes! Now that I've given you my tips, I'll let you in on my very latest and very greatest (and most successful) visualization. Remember that old saying, "if you don't have something nice to say, don't say anything at all." Well... lets apply that one here. This is a very personal thing, but I felt guided to share, because there maybe someone out there that would relate and can use it as a guide. Its easy to judge, but every person has to do what works best for them, and this is how I get in touch with my true self. Each night before falling asleep, I take myself to that childlike energy. This is easier and easier each night, and eventually has become like turning on a switch. I start at the top of my head and I envision the source of my health issues as bugs or caterpillars. My dialogue with them is of pure love and gratitude. I tell them I love them so much and thank them for all the love and knowledge I have gained from the experience I've had with them. I say that because of how well they have prepared me, I am now able to transform into a beautiful new person and they are now going to transform into something new and beautiful, as well. In order to do that, I tell them we can't be together any more. 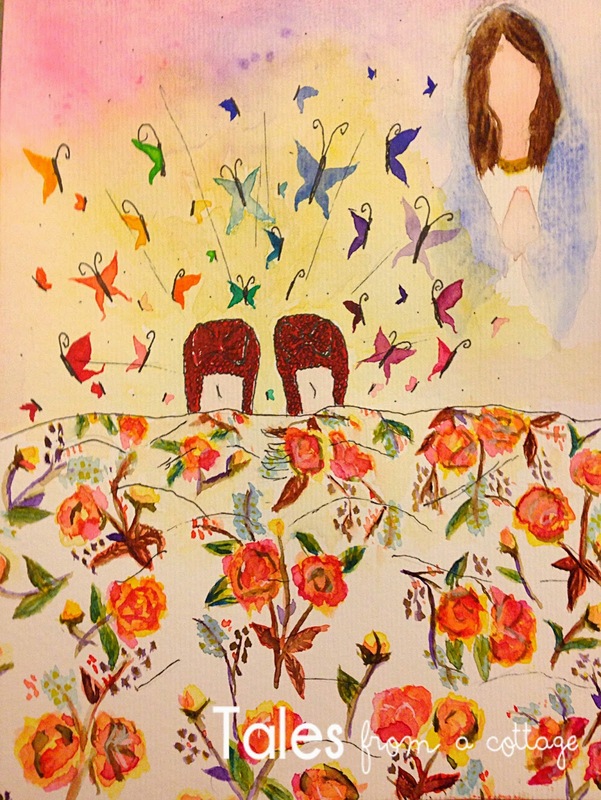 I say that I love them, and we will be together again when we are in the garden and they become butterflies. As I tell them this, I imagine them working there way down from the top of my head and a CRYSTAL clear light guides them downward and fills their void and my entire body with warmth and love. As they exit my body, they leave through my feet and magically turn into gorgeous butterflies of every color in the color spectrum. As they leave my feet, I picture myself waving goodbye with that childlike naiveté, yelling out, "Bye! I love you!" Just like I did when leaving my grandparents' house... fully believing in what I'm saying and what is happening. The photo above is of a painting that I did to keep by my recliner, where I spend most of my day. I am clearly not an artist, but every time I look at the painting I'm instantly taken to that place in my mind. I've been doing this for almost two weeks. These have been the best two weeks I've had in months. Still not great, and some days are better than others, but I'm consistently walking better than I have in months and have had more energy, and a clearer mind. I'm doing other things different as well, to help myself like medications, and diet, so it could be any one or a combination of those that are causing this improvement. The thing is, it started going upward the next morning after I started this. Make your own conclusions. Nothing but good can come from this, so whether it really works or not makes no difference. I guarantee that you will feel something positive doing visualizations of this nature. I'd love to hear some of your ideas and ways you use visualization. Peace, Love, and Happy Manifesting! !